With a strong beach theme, we knew we wanted driftwood to have a strong presence in this space. When we checked out the pre-made options or "driftwood" stains on the market, we weren't impressed. One of the biggest issues was the darkness of the wood. They seemed to simply rely on a grey toned stain to convey driftwood, without showcasing the subtle complexities and lighter, worn textures driftwood is known for. SO we decided to make our own. Here is the process we made up and ran with! Remember, the fun of driftwood is how unique each piece is. It is the perfect starter project since each inconsistency or "imperfection" actually adds to the piece. Have fun with it and add your own spin! MATERIALS USED: Rough Sawn Pine, Minwax Dark Walnut, Cabot Weathering Stain Silver Grey, Random Leftover White Paint. TOOLS USED: Sanding instruments (electric, block, and paper), Chip brushes, rags, random assortment of tools and objects from the shop (to mark wood). Rough Pine board vs a driftwood test piece. Before diving into your stock of lumber, even when following step-by-step tutorials, be sure to test staining on smaller scraps of wood. The beauty (and complication) with using a porous, natural material like wood, is no two results will be exactly the same. A subtle change in grain can completely alter the result of your method, even within the same piece of wood. Variations in materials also affect your results. Different colored stains have varying consistencies and vibrancies which sink into surfaces in unique ways. Some need to sit for longer to achieve a desired effect. Others must be wiped immediately before they completely saturate the wood in one color. And more than anything, the order in which you layer your stains with when you work the surface (sanding, texturing, grinding) will affect how all of those details play together to form the right tones. This last point is true for driftwood in particular. Although, as a result, we want the surface to be very light.. we want subtle plays of color and texture to mimic years of sustaining abuse from the elements. Otherwise we would just white wash the boards and call it a day. Another challenge is achieving that silvery grey tint. Grey stains are very thin. You can’t just paint light colored board with grey stain and have much change. Timber soaks up the watery substance and barely seems to change. This is because you need a darker base for it to settle on. Something to give it body and help it pop. By combining these different methods in your own way, you can achieve a variety of effects in a driftwood or reclaimed wood style. One of our favorite parts, is seeing what techniques you could stop at to create a barn board for example, just by using a few of these steps than stopping. Each layer is an exciting development in the texture and color of the wood. Making the experience a very pleasing, and organic evolution. 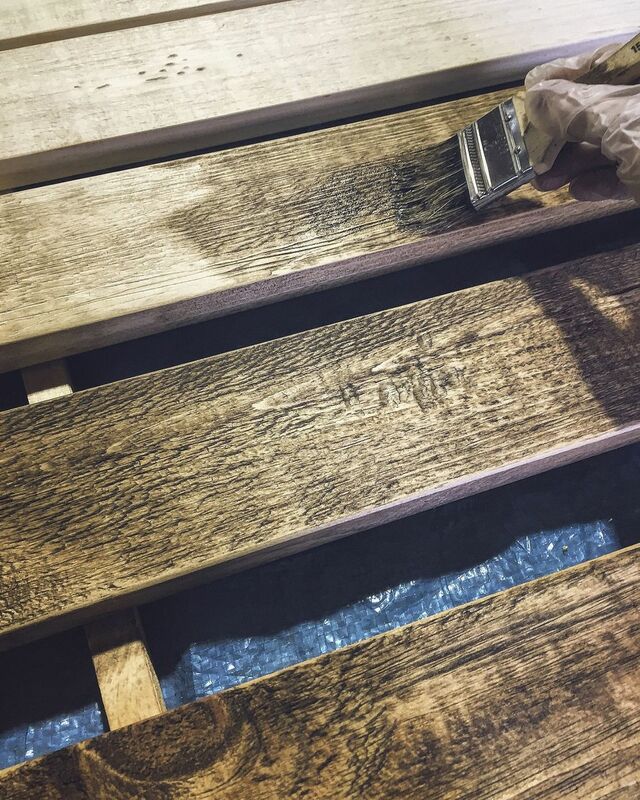 Once you have a general plan-of-action, you can set all of your materials out and set up spaces to apply your stains, as well as designated areas for the lumber to dry in-between. Sometimes we liked the effect of doing multiple steps in a row, which the wood was still wet. Other times we let the pieces dry overnight, so the colors wouldn't muddy or we could retexture the wood and add more depth. Part of this is trial and error. And no matter your direction, things will need to be tweaked or will turn out different when working with the larger boards and a mass quantity of material. Unlike an ultra high-end finish that requires closed off space with no dust particles and a specific set of techniques, driftwood finishes are near fool proof in the way the inconsistencies add to the overall effect. We welcomed anything that happened by accident or from being expressive with the application to add to a distressed and well-lived look. Getting a plan in place beforehand helps you create some form of consistently across many boards, and shows you what to set out before each stage. Easily the most exhilarating part of creating driftwood is going to town on a stack of lumber using.. well anything you can find that will make a mark, ding, or dent. Luckily we are well equipped with tools that double as zombie apocalypse weapons in the shop. So this task was a no brainer. Being creative people, it was only natural that we came up with stories along the way of what these pieces of wood might have gone through to create such blemishes. We used everything from a hammer, mallet, chains, screwdrivers, commercial stapler, beer bottle caps, chisels, sand blocks and paper, Dukes teeth, nails, the table, metal wire things you spin on the end of a drill (I'm the creative one not the technical one), and anything else that made an interesting impression and was hard enough to be hit with a hammer into wood. Once you have created unique marks or patterns randomly across the stack of boards, you need to smooth them out. Driftwood is often softened and rounded from tumbling around in moving water, or being constantly bombarded by waves. Again, there is no need to be consistent here. Not all areas need to be exactly as smooth as those around it. Each side may have worn differently and not every imprint is made at the same time in "the wild". Have fun and do what feels natural. We did keep track of where certain boards were going since we would be using the wood for not only the display cases but for a few desk top surfaces as well. Since a group of them would be used directly on a workspace, we made sure to smooth them out more consistently and refrain from marking them up as much. The first tone you should be laying down is a dark one. Mochas, Chocolates, and Black hues will work well. 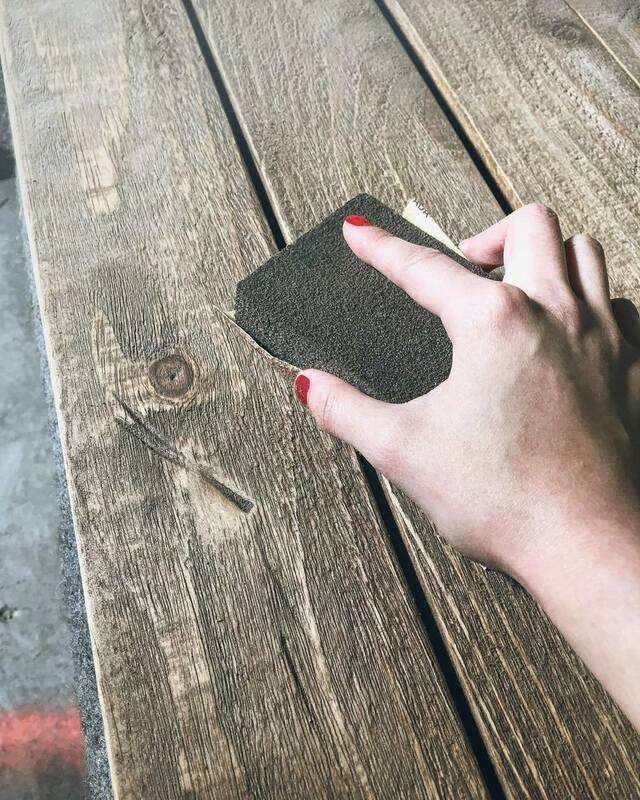 We applied it quickly with a chip brush and wiped off the excess after reaching about halfway down the board. I believe we used a Minwax, which has a gel consistency and a deep tone. You don’t want to completely saturate the board with darkness, so be wary of leaving the stain on too long. Since we were nearing the end of day one, we let half of them dry overnight. The second half were applied the next day then immediately went into the next step. Sanding between stages is very important with this process. Anything you can do to wear the grain down along the way will help distress the raw lumber. We found that sanding while the boards were still damp helped push the fibers into the cracks and crevices, helping to smooth them out. It helped give the wood that grainy, softened texture that driftwood often has. Not every part of a process needs to be tedious. Sometimes side effects from techniques can create better results than if you tried to do them on purpose. Once you have achieved a rich base, a thin grey stain will actually make a difference when applied to the previously blonde Pine. Because is is so delicate compared to the Minwax, we left the grey on for much longer before wiping off. In some cases we waited hours, in some we just left in on. Every so often we wipe it off by then end of a few boards worth of painting, repeating the process two or three times. Applying the grey to wet vs dry Minwax also gave us slightly varying effects. Going with the flow and switching up the application techniques slightly as we went gave us a range of tones and allowed us to conform the process to our schedule. If we hit the end of the day and needed to go home, we let things sit longer to see how it would look in the morning vs wiping it right off. We hope to continuously show how there isn't much right or wrong to this particular process. It made the experience fun and experimental. If you are just getting into woodworking or staining, doing a project like this is an awesome way to test products and feel more comfortable working with these materials. The same goes for other distressed textures like barn board. Vintage is in right now so we assume we will be testing more versions in the near future. Again, it is important to be sanding in between dry times. You can start to see the different tones forming as you wear certain sections down to the dark tones. Look at them blend and see how they fill in the marks you created. It's also smart to make some new ones as you go, making them look fresher than the original round. Not too many! Just enough to add interest here and there. You may notice that although the boards are currently grey, they don't look quite right. Although many of you may want to stop here, I urge you to continue forward to this crucial step. At the moment you have laid a solid foundation, the tones showing through now range from blonde pine, to a deep umber, shades of grey, and whatever they create when mixed together. But these boards lack unity. They are still very raw in places and need that final touch to look truly worn and realistic. This is where white paint steps in. Mix yourself two versions of paint and water. One with just a touch of paint so it is more like milk. Flip the second mixture so it is mostly paint with a touch of water. Switch between the two white mixtures to create a result you prefer. We used the water-heavy option on the whole of the board, keeping the paint-heavy option for the edges and to push into divots. Play with the opaqueness of the whitewash as you move around. You can see the variations we achieved in the images above. Some wood finishes use dark tones to highlight marks, creating a shadowy effect. Others use a highlight in the same area which totally transforms the look. A lot of vintage or distressed styles, like driftwood, tend to go that route. We played with it in areas to create a cool effect. This part of the process is a mixture or adding white wash, wiping it off, and sanding as needed. We don't recommend leaving the white on for long or it will be overpowering. So why don't we just whitewash from the beginning? Won't that create the same look, faster? I hope you've been paying attention, because I'm sure you already know the answer to that..
Once we worked through the general steps above, we went over each board and made sure the balance was right. If things felt to dark, we added more white wash. If things felt too raw or rough still, we sanded them down. If things were too light or unique details were lost, we used the Minwax to bring them back out and add depth in again. This can be tedious with so many boards, so focus on the ones that will be seen and will highlight the build. Pieces that will be tucked away in the back, or edges that will be cut off can end at an earlier stage. Don't waste energy on something that will be discarded or covered up. To help avoid this plan ahead where boards will be used. Once you've sealed the transformed lumber, you can pre-build some items before doing the final round of touchups (as to easily focus on the areas that will be seen). This is particularly helpful when trying to create final highlights. When everything is basically done and you are happy with the results, it is time to seal the boards. It's important to test sealers first to see how they affect the finish. Some make the boards darker, some give a sheen. Find one that will help protect the wood without transforming all the hard work you just did. Driftwood isn't typically shiny, but we chose a finish that had a slight sheen to it since we are creating a boutique look and want to dress things up slightly. The perk of this, is the sealer sinks down into the grain and markings. When you do final touch ups on the surface, that sheen remains in the crevices, catching light from different angles and adding another dimension. If you want to create a wet look, play with sheen even more and see what you can come up with. Matte finishes are best for typical driftwood results. 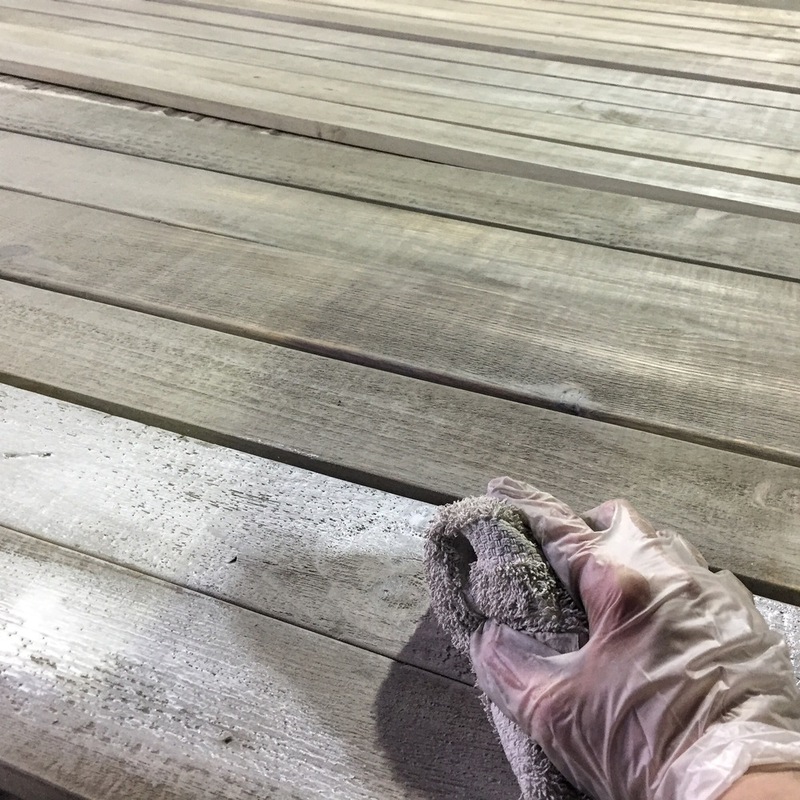 Dry brushing the surface with a touch of white dulls down any sheen and brightens the boards back up to complete the look.